Thats right, I quit Yahoo. My last day was Friday, April 14, after 2 years 8 months, i was ready to move on. Why quit you ask? Well, those that know me, know that i’m not one to sit around and do nothing. I always got ants and in my pants. And frankly, my job was getting boring – responsibilty but no fun. My last project, My Web 2, launched in the summer in 2005, and was winding down, so it was a good time to leave. 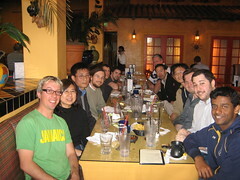 Thats the team plus some other yahoo coworkers at my going away lunch. How nice. But more than that, I had some money saved, and i’m not in a relationship, no house payments, nothing tying me down – so clearly i should quit and travel. Clearly. Indubitably. What’s next then? Thats the biggest question. Well, as i mentioned, i want to travel, mainly New Zealand, Australia, Thailand, and other parts of Asia. Of course I live in San Francisco and there’s tons of stuff going on here . . . all the time. So it was tough to figure out when to leave, but i did it. I’m going to visit my sister and her family in early july, then i’m off till october, when i have to be back in california for a wedding (plus another wedding in december in costa rica). I still need to work out the details of where i’ll be between July and October, so don’t ask. I’ve traveled a bit already, and i’ve found that without the time pressure, it’s more fun to plan as you go, be spontaneous, just wing it. Afterall, we do have “the information superhighway” and email to keep us all connected. Plans are soooo last century.